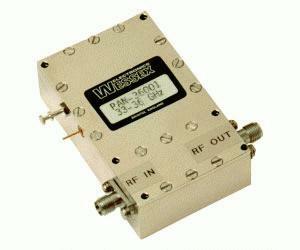 Model PAN-36001 provides +31 dBm Psat, or not less than +29dBm at P1dB output power,over the frequency range 34.5 GHz to 35.5 GHz. The design concept of this amplifier is such, that when required, alternative frequency ranges and higher output powers can be provided. Quality Control throughout manufacture and test is in accordance with the strict requirements of ISO 9001 Registration (which we have held since 1994).